Agendas are published 3 clear days in advance of each Parish Council meeting and document the items that will be discussed at the Parish Council meeting. No other business can be formally agreed (or "resolved") if it does not appear on the agenda. Members of the public have the legal right to attend any Parish Council meeting and listen to the debate. To further encourage inclusiveness and transparancy, the Council also permit members of the public to speak or raise questions on any agenda item for that meeting at the start of the meeting under the agenda item "Public Participation". Members of the public can not form part of the debate during the meeting, unless a point of clarification is required. This will only be initiated through the Chair. 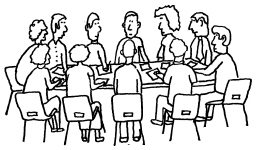 Typically, our agendas contain receiving apologies from members, approval of the previous minutes, the consideration of items of correspondence, approving payments and other financial-related items, debate on planning applications and information and updates on current projects across the Parish. Agendas for upcoming meetings are downloadable on this website nearer to the time of the meeting but are also advertised on the three Parish noticeboards in Shenton, Sutton Cheney and Dadlington. Draft minutes from the latest Parish Council meeting are made available on the Parish Council website within two weeks. They remain in draft form until they are approved at the next Parish Council meeting. Minutes of Parish Council meetings within the last twelve months are available to download below. Under the Freedom of Information Act, minutes of the Parish Council meetings are available to anyone who wishes to see them - please contact the Clerk for further details.